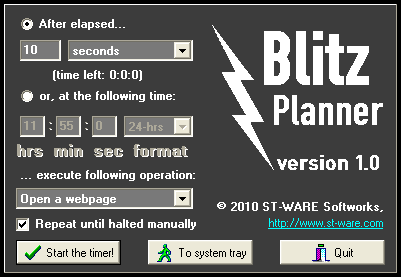 As a teenager, I used to publish small freeware Win32 applications and system tools under the name ST-WARE Softworks. Because the original site is now defunct, I decided to put up a mirror for all of them here. Feel free to share – however since I have released them quite a long time ago, no additional support is provided. Please update your links or bookmarks. Note: usage is at your own risk – I take no responsibility over any incidental damages on your machine. Some of these utilities might trigger a false alarm in certain antivirus software, this is caused by internal compression routines which pose no real malware threat! A service utility to manipulate with your system’s CMOS RAM. Version v2.1 (11th Aug 2011) runs straight under any 32 or 64 bit Windows operating system (inarguably, world’s first such application to do so!). To work properly, administrator privileges might be required. Take care with laptops – their BIOS password, if set, is usually stored in an EEPROM outside CMOS and in such cases, attempting to clear the CMOS can cause your BIOS to lock itself up. 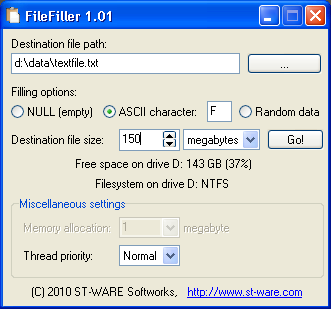 FIXAUTO: Use this if having problems with Autorun on NT, 2000 or XP. MON_OFF: Turns your monitor off, without sleeping the computer. REROUTE: Use this, if you have a DOS/Win9x machine equipped with an LCD screen that doesn’t support the 640×350 mode. hi, i have an asus T100TAM and i wana rescue password for 2012/01/01 please help me. how i get password for lenovo r61? Didn’t work on resetting bios administrator password on HP 2570P…. This tool cleared my BIOS supervisior password for Lenovo T430. But the options are still in grey. I am not able to change anything. Is there a way around? I am quite desperate as my boot options are limited to HDD and LAN. Now i would like to reinstall my laptop with a different OS. If you want to get into your bios just take out your battery and insert it back in once it boots up its should load up the bios screen and you will be able to change anything you want without using a password it worked for me since I forgot the password I set on my bios. Hope it works good luck. I have a HP Presario CQ5110Y desktop running Win 7 and when running your program received the error message “Test CMOS read failed.” Any idea why and can it be fixed? Thanks!! Try re-running under administrator privileges. I have a Toshiba Satellite Radius P55W-B5224 laptop that I need to know how to reset the BIOS password. When the laptop is turned on it goes right to a password screen. I don’t remember what that password is. Can you assist with a way to flash the firmware to remove or reset it? I have a Lenovo Z570 ideapad laptop. it has a bios password i don’t know. it.s bios is of phoenix.i tried Cmos de- aminator. but it says test cmos read failed. thanks..i will try this, i did not locate my cmos jumper to clear cmor memory.. I have one DELL E5510 – laptop and I’m not shure if I can use this software to delete (clear) BIOS password. Any idea? I’m using Windows 7 32Bit. I have tried many different methods, including the original password without luck(?)! I have saved the cmos into a DEA file. is there a way I can use this to see the current password in plain text? Just a quick note to say thanks for the FileFiller.exe utility. FWIW, I’ve just downloaded it and used it on a Windows 8.1 system. There’s a high chance the password is not stored in the CMOS but in a separate (EE)PROM. Thanks a lot. 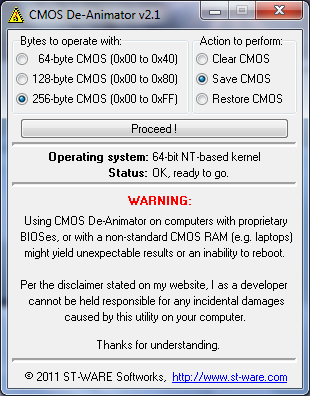 I could recover CMOS password using CMOS De-Animator. hi venu I faced similar problem. Could you help me how to solve this problem. pleas say something as soon as you read this message. i let it on 256-byt CMOS and save CMOS, I pressed proceed. when i restart the laptop, it ask me for power on password. I have no Password. i remove the backup battery but it not fix the problem. You attempted to “clear” the BIOS SETUP password with a “Save” option ? Well that indeed would not help at all. As stated in the application itself, with a dark red warning, some laptops might not acknowledge accessing the CMOS RAM and will lock themselves up completely. In such laptops, the BIOS SETUP password is NOT stored in the CMOS at all – mostly in a separate EEPROM chip. Get your laptop serviced. Unless there’s a universal BIOS password or other technique for your machine, you might have to get the BIOS chip replaced. When it requests the power on password, leave it blank and press enter. Or Post the model of ur Laptop in full.